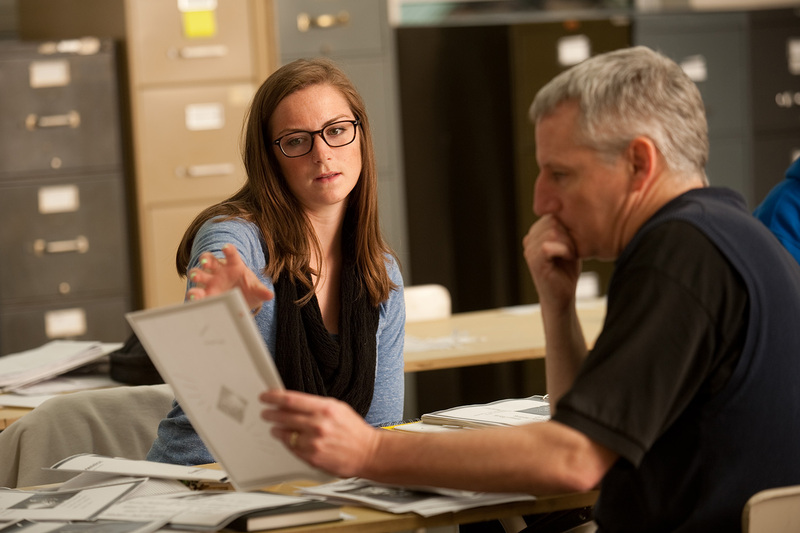 Hesston College’s art program offers a series of drawing, painting, photography and design courses to prepare students to complete a four-year art degree for a variety of career paths. Students interested in problem solving, sharing information, storytelling, physical work, and any creative pursuits, will find art to be a great fit. Art in all of its forms is uniquely suited for honing aesthetic and concrete skills, learning new ways of thinking, and building the foundation for life-long interests. Many students in terminal degree programs enjoy art classes as a creative release while they pursue their major. Studies have shown that a degree in the arts brings a highly useful set of skills to any career. The Hesston College community offers some unique local resources. These include area artists and partnerships with area universities for workshop, lecture and presentation opportunities. Some past workshops include large scale ceramic sculpture with Conrad Snider, figurative sculpture with Pat Hines and an aluminum casting day with the Fort Hays (Kan.) State University mobile foundry crew. Opportunities for independent self-designed studies provide a unique and precise way for students to pursue interests deeper than regular class work may allow. Within the department, there are internships available to develop related skills for the visual arts, as well as a competitive graphic design internship with the college’s Marketing and Communications department to gain valuable job skills. The art curriculum will provide you with the strong educational foundation you will need for upper-level studies and an art degree. Students receive core courses, individual study and support in finding a niche and expanding creativity and skill. 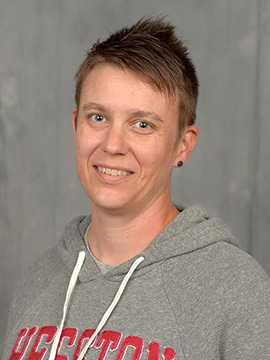 Academic advisors work one on one with students to ensure requirements are met for a seamless transition to continuing education and professional careers. Graphic design is a focused path within the wider art department that uses a combination of visual and textual content. Students interested in problem solving, sharing information, storytelling, physical work and any creative pursuits will find art to be a great fit. Art in all of its forms is uniquely suited for honing aesthetic and concrete skills, learning new ways of thinking and building the foundation for life-long interests. Many students in terminal degree programs enjoy art classes as a creative release while they pursue their major. Graphic designers can find work in a wide variety of professional areas including advertising agencies, corporations, colleges and universities, newspapers, magazines, publishers, websites, museums. You can also work as a self-employed freelance designer, securing clients and projects in a variety of areas. Studies have shown that a degree in the arts brings a highly useful set of skills to any career. The graphic design curriculum will provide you with the strong educational foundation you will need for upper-level studies and a degree. Students receive core courses, individual study and support in finding a niche and expanding creativity and skill. Academic advisors work one-on-one with students to ensure requirements are met for a seamless transition to continuing education and professional careers. The Friesen Center for the Visual Arts opened in fall 2009. 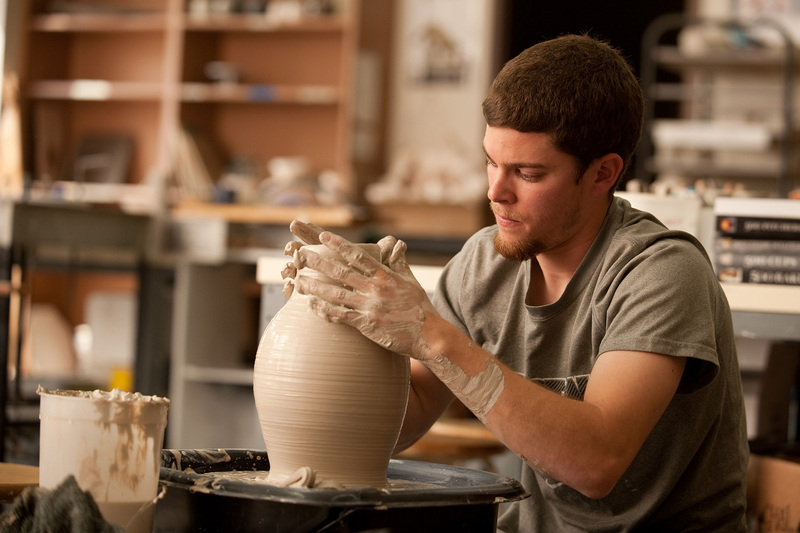 Friesen Center features studios for ceramics, sculpture and drawing/painting as well as a Mac lab, classroom and the Regier Friesen Gallery. The studios feature high ceilings and large windows, an inviting and inspiring environment for art students. The building is named in honor of Paul and Wilma Friesen. Paul served as Hesston College’s first art faculty member, founding the program in the spring of 1957. He taught at Hesston until his retirement in 1978. 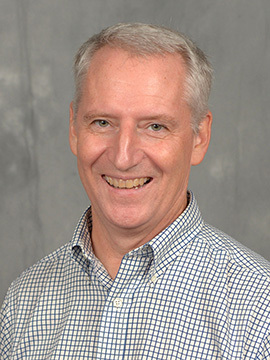 Paul returned to Hesston College to teach ceramics from 2001 to 2005. The gallery in Friesen Center filled with student works from the 2011-12 year. 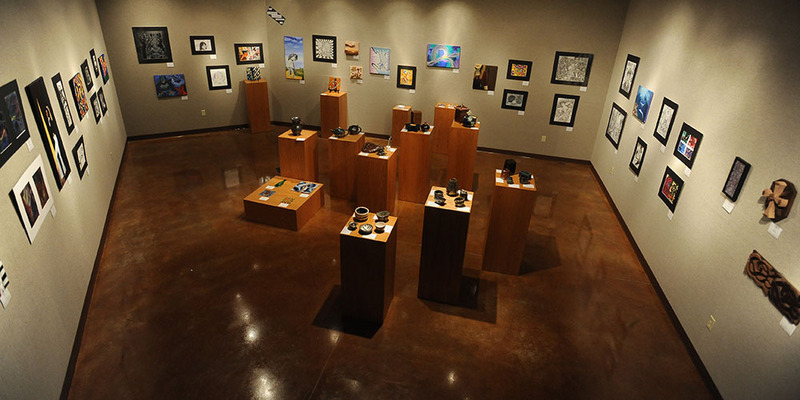 Located in Friesen Center, the Regier Friesen Gallery hosts several exhibits each year. Gallery hours are 9 a.m. – 5 p.m. Monday through Friday, 1 – 5 p.m. Saturday, and 2 – 5 p.m. Sunday. 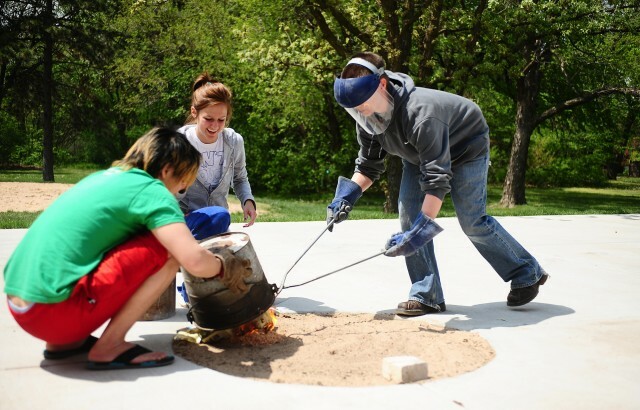 Art faculty member Hanna Eastin (right) assists students with a raku firing.